The Japan Foundation and CAMA Vietnam are proud to present internationally famous Japanese jazz group SOIL & “PIMP” SESSIONS who will entertain Hanoi on March 2. The event marks the 40th anniversary of diplomatic ties between Japan and Vietnam (Japan – Vietnam Friendship Year 2013) and will take place at the Van Ho Exhibition Center, Hanoi. SOIL & “PIMP” SESSIONS combine world class musicianship with the coolest of sounds and attitude into a heady mix of jazz, fun and entertainment. Their brand of jazz is unconventional and designed to break down barriers, whether they be conventions of genre, cultural barriers or stolid audience-performer relationships. Starting out in Tokyo clubs in 2001, the band quickly became notorious and attracted worldwide attention for their new brand of aggressive, energetic and danceable music which they called “death jazz”. Before long, the band was being championed by musical tastemakers like Giles Peterson who released six of the group’s seven albums on his Brownswood recordings label. Since 2005, the band have played the biggest festivals in Europe, such as Denmark’s Roskilde Festival, Glastonbury in the UK, Fuji Rock in Japan and the prestigious Montreux Jazz Festival in Switzerland. They also appeared on Later…with Jools Holland, the UK’s longest running and most respected live music TV program. The band’s live show is famous the world over for being an interactive experience, something that sets them apart from other jazz groups. As the band themselves say, “We always felt that in the world of jazz, there was an unwritten rule that the musicians were to concentrate on their techniques and the audience were simply there to admire, like a transmitter/ receiver relationship. We wanted to break away from that and create exciting jazz with far more interaction between the players and the audience”. The band pulls this off with both their infectious rhythms and their energetic frontman Shacho, who acts as “the agitator”, playing a key role by in connecting the audience to the band. 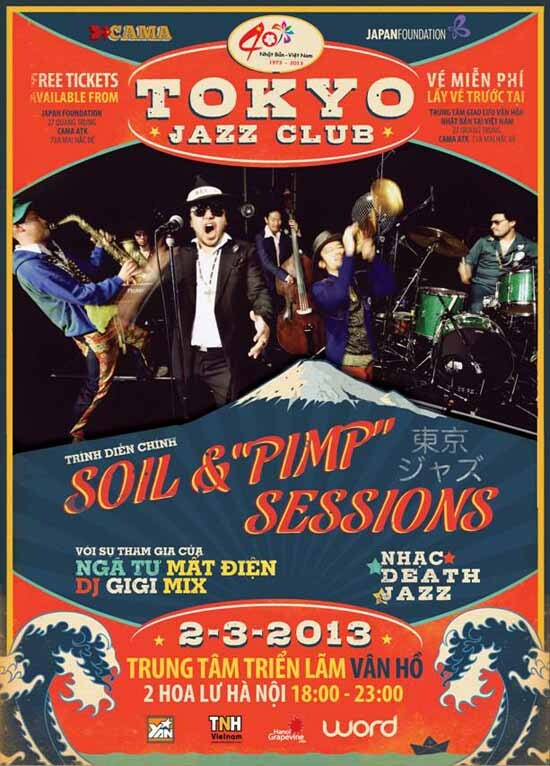 Joining SOIL & “PIMP” SESSIONS in Hanoi will be local jazz-funk group, Nga tu Mat dien. The quintet has been playing shows in Hanoi’s capital for more than 15 years and has a tight enough sound to prove it. At the Van Ho Exhibition Center, the group will be reinventing jazz standards through a funk and Latin lense. Keeping the party going between bands will be GiGiMix, one of Hanoi’s most entertaining DJs. With a love of swing, jazz and funk, the French-native never fails to keep crowds in the party mood with up-beat, feel-good sets that cross genres and cultures. The concert will take place at the Van Ho Exhibition Center, 2 Hoa Lu, Hai Ba Trung on Saturday March 2nd. Tickets are free and can be obtained from CAMA ATK, 73A Mai Hac De, Hai Ba Trung and The Japan Foundation, 27 Quang Trung, Hoan Kiem.